Chelsea could be on the end of another battering by Manchester City in the Carabao Cup final on Sunday unless Maurizio Sarri tries a different approach, says pundit Paul Merson. The Blues recently lost 6-0 in their Premier League clash with City at the Etihad Stadium, with Pep Guardiola’s side absolutely running riot that day. Sarri’s future has been called into question since then, with Chelsea known for sacking managers for less than this, with the Italian tactician overseeing the club’s worst ever Premier League defeat. 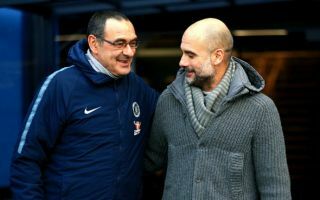 It’s far from ideal for Chelsea as they prepare to take on City again in the Carabao Cup final at Wembley, and Merson hopes to see the manager try something different or he expects the result will be something very similar to the one we saw at the Etihad. “He tried to go toe-to-toe, tried to press Man City, and it’s hard to do that because the goalkeeper is so comfortable on the ball, so when you try to squeeze, it doesn’t work,” Merson told Sky Sports. City won the League Cup last season as well as they beat Arsenal in the final, and they’ll be confident of retaining the trophy in what could be an important boost for the club as they attempt to battle Liverpool for the Premier League title.